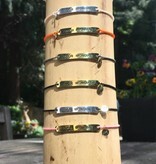 New in our collection are the bracelets with a text plate with the words' Amor Mondial. A message of love to wear or to give away to someone special. With our signature flower and two small gold colored beads at the ends.